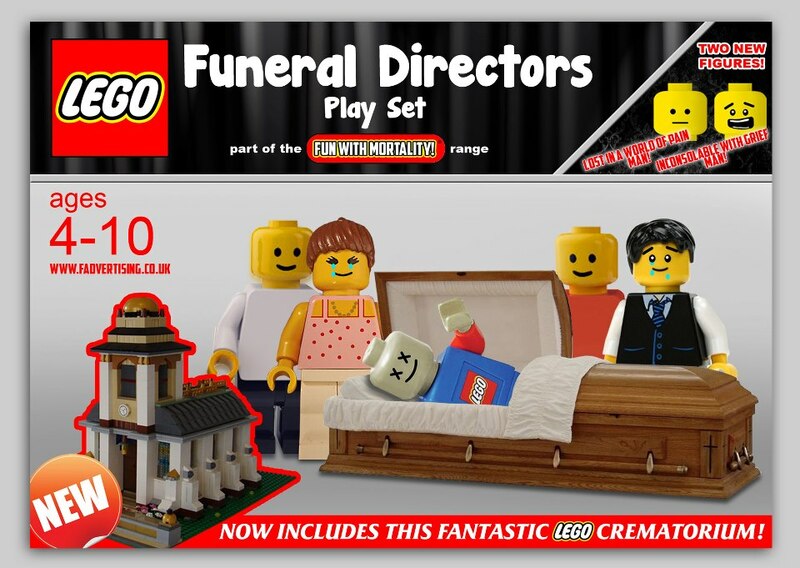 Here is a fake lego funeral play set, complete with crying mourners, a coffin, and even a crematorium. Personally I think it is rather amusing, and a wonderful idea! This has already made the rounds on certain circles (such as coffin-talk), so I thought it appropriate to discuss it. Despite the fact that it is fake it has potential, we are seeing more alternative and specific lego sets as lego becomes more popular. Take for example this lego aircraft carrier, or this life size lego house built by James May. There are numerous lego groups and exhibitions, even official ones like Brickworks in Sydney. It is not beyond reason or possibility for lego to make a certain number of funeral theme sets. Some might think a lego themed set would be upsetting or inappropriate for the most part. A mixing of children's toys and death is rather touchy to say the least. But as the comments on this "Confessions of a Funeral Director" post show many people would like it. I asked a few friends who I know to be 'squeamish' about death and funerals. One is so 'squeamish' that she gets uncomfortable at seeing a photo of an empty hearse. Because it reminds her of funerals and death an the likes. Yet even she (and everyone I spoke with) really liked this idea and would buy it or compete for it. Perhaps one day a funeral company will get in touch with lego and have a promotional event, I (and a few others I know) would certainly participate! It is a possibility, and there is a market, so why not? I think it would be a great set! I want this set. I run workshops where we discuss the inevitability of death and this set would be brilliant!! (We have one that we put together using bits out of other sets, Lego have a few dead bits and pieces). I meant Lego set, but I think a legislation set would be great for politics...maybe Lego needs a grown up line. A cemetery set and funeral home/director set was already given out by a vendor at a national convention last year. It's "IN" your vag or "UP" your vag, not "down". I bet you don't have one. fkn weird doesn't even begin to describe that post! I actually contacted lego since I only saw a pic elsewhere online and no explanation that it was fake. It's an interesting blog and providing very nice information about the doctor’s medical cause of death certificate.